Serving Together is our work demonstration program. Participants join with volunteers and do basic works of service together. During this time they build relationships, providing evidence of employability, and introduces them to our mentoring process. 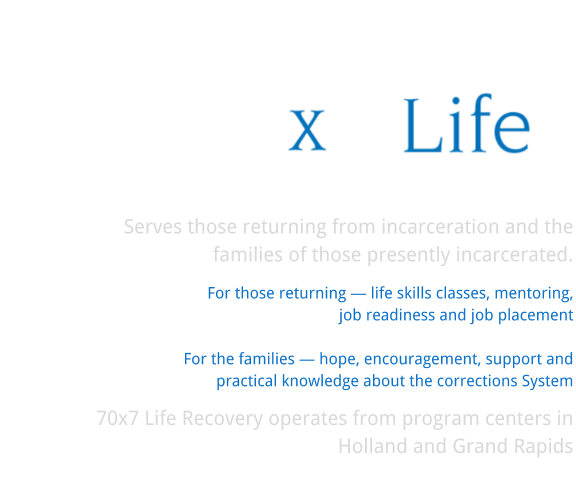 Stronger Together is a program for families of incarcerated individuals. A safe place to share grief, anger & pain with people who understand. Dinner is at 6:00 p.m. and there will be a group sharing time for the adults starting at 6:30 p.m.
During the adult group time, the teens (13-17) will have a sharing group time led by people who understand their concerns. Also, Children (5-12) can play, have fun, and there will be people there for kids to talk to if they need help. Every 2nd and 4th Thursdays at Ridge Point Community Church. There is NO cost for this program. If you wish to attend or volunteer, please contact our office for more information by calling 616-796-0685. A women's group of returning citizens, law enforcement, and other resource representatives that work to break the cycle of recidivism. A women’s group of returning citizens, law enforcement, and other resource representatives that work to break the cycle of recidivism. A men's group of returning citizens, law enforcement, and other resource representatives that work to break the cycle of recidivism. A men’s group of returning citizens, law enforcement, and other resource representatives that work to break the cycle of recidivism.